Airborne makes composite overhang panels for aircraft giant Fokker. Airborne, a manufacturer of composite products based in The Hague, The Netherlands, has been awarded a contract extension to make composite overhang panels for aircraft giant Fokker. ‘As airlines are engaged in heavy competition for lower airfare rates, the focus on affordability is particularly intense in the aerospace manufacturing supply chain,’ the company said in a press release. 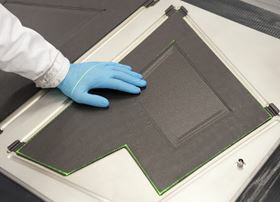 ‘For years Airborne has been focusing on making composites affordable. […] To accelerate this, Airborne is intensifying its efforts to materialize its composite automation proposition and to make separate units ready for market in the near future. This story is reprinted from material from Airborne, with editorial changes made by Materials Today. The views expressed in this article do not necessarily represent those of Elsevier. Thyssenkrupp Aerospace will continue to handle the complete aluminum supply chain management for STELIA Aerospace in France and Tunisia.